THEY improv provides improv comedy, game shows and murder mystery dinners for entertainment options for college campus events and private parties for students and faculty. For campus activity boards, THEY improv has a wide array of possibilities that can make your life easier. Simply contact us and see how we can improve your programs. Illinois college campus comedy events are what THEY improv is all about. Whether you need a murder mystery dinner show for your on-campus organization, or a game show for your fraternity or sorority, or an improv comedy show with comedians to entertain a much larger crowd, THEY improv has a show for your group. At our Universities across the state there is a very different need to provide students with fun things to do. Entertainers need to be geared towards this kind of performance. The crowds have a very different sense of humor than the corporate world or even family private parties. The students have a particular world view and shows have to be custom-tailored to them. For each of our show types we have developed varieties aimed directly at Illinois college campus events. Murder mystery dinner parties are a blast! For Illinois college campus comedy events, THEY improv has created a variety of shows designed to entertain. From Rock Star Meltdowns to the Last Slammer Standing and other customized shows, each involves audience participation and loads of laughs. Audience participants become suspects and perform for their classmates to allay suspicion and reveal the true culprit. A night of improvised comedy is a great way to entertain large groups of students. The performers take suggestions from the audience and create an Illinois college campus comedy event right in front of their eyes. With a variety of sketches, improvised games and comedic monologues, THEY improv gets the crowd laughing and having a great time! Game shows are a great way to entertain smaller groups. Using information from your group, THEY improv writes questions that are directly related to your university organization. The creativity and the fun then come from your members as our host facilitates your group entertaining themselves. For fraternities, sororities and other university organizations, THEY improv can custom-tailor to fit most any situation. From team building workshops, scavenger hunts, mix-and-mingle functions or just about anything. Everything we do...it's all Greek to us! Let THEY improv know the size of your group and we can provide you with ideas and a quote for a tailor-made show to make your Illinois college campus event a success. THEY have already entertained at many top universities across the country, why not let them provide you with an evening of entertainment that will not soon be forgotten? Contact us today to learn about how THEY can help your Illinois college campus organization event succeed without really trying! 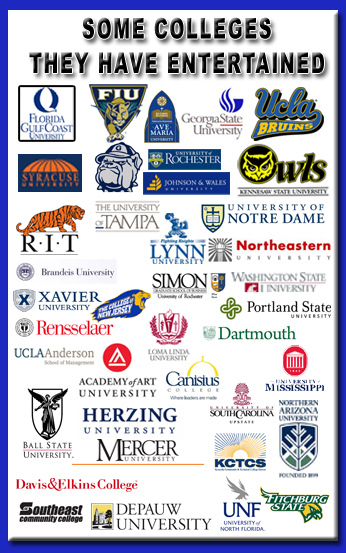 We are proud to serve the higher-education institutions throughout the state including Chicago State University, Eastern Illinois University, Governors State, Illinois State University, Northeastern Illinois University, Northern Illinois University, Southern Illinois including Carbondale and Edwardsville, University of Illinois in Chicago, Springfield, Champaign-Urbana, Western Illinois University in the Quad Cities, the University of Chicago, Concordia, DePaul, IIT, Loyola, Moody Bible Institute, Northwestern, Rockford, Roosevelt or anywhere else in the state. "Have Laughter, Will Travel".